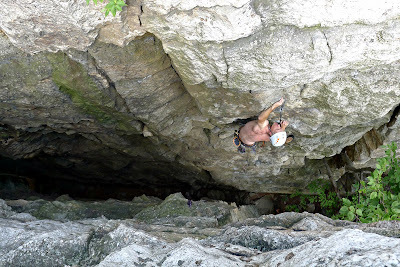 A highly accessible 40'-80' tall cliff composed of very solid rock with 100+ routes and several 3-star classics would be deservedly popular nearly anywhere in the United States. In an area like the Gunks many cliffs like this go unvisited and remain underrated. Peterskill is one such cliff. The red-headed stepchild to cliffs on the Mohonk Preserve, the PK is popular with topropers and newer climbers who feel less intimidated there. I've been taking clients there for nearly 8 years now and I'd generally dismissed the area. Yes, I'd climbed a few of the classics there, routes like Golden Dreams and Milil's Magic Arete, but nearly all of the routes there are good climbs on very solid, gritty Gunks conglomerate. This year I've started paying more attention to the fantastic routes there. I climbed there last weekend with my partner Dolci and again Thursday evening after work. The largely shady, shorter routes are perfect during the summer heat when the Trapps are too hot. With the Mohonk Preserve always feeling so crowded all the time on the weekends Peterskill is worth a look. The bouldering is fun and the short stout routes require very solid Gunks face climbing skills.